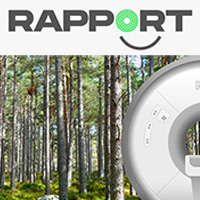 Rapport provides a reassuring two way audio and video link between the MRI patient and the technologist, plus a complete patient entertainment system. It's the cost-effective solution to increase patient comfort, reduce stress, and limit the need for sedation: delivering better patient outcomes at a lower cost to the provider. 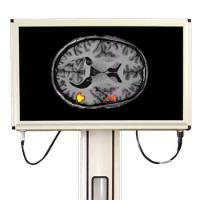 BOLDscreen displays are designed for fMRI, with accurate timing and built-in calibration. Other displays introduce uncontrolled resampling, scrambling your stimulus – BOLDscreen eliminates this insidious problem. BOLDfonic delivers high-fidelity acoustic stimuli. Electro-dynamic drivers produce excellent frequency response with wide dynamic range. Synchronous triggering and a fully–loaded amplifier allow sophisticated control for rigorous multimodal EEG/fMRI. Headphone and earbud options for tight fitting headcoils. LiveTrack AV eye tracker provides robust, real-time estimates of eye rotation, Direction of Gaze coordinates and pupil size. 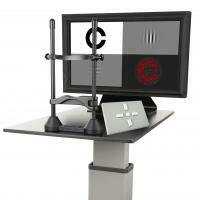 Close-to-the-eye imaging allows easy setup and fast calibration. Cambridge Research Systems' background in research applications ensures that our products provide precision and control, while remaining reliable, practical and affordable - the engineering philosophy we have held since our incorporation in 1989.